Cigarette smoking is the most important cause of COPD (Fletcher 1977, Burrows 1977, Matheson 2018). There is a close relationship between the amount of tobacco smoked and the rate of decline in forced expiratory flow in one second (FEV1), although individuals vary greatly in susceptibility (Fletcher 1977). Around half of all smokers develop some airflow limitation, and 15 to 20% will develop clinically significant disability (Fletcher 1977). Even smokers who do not meet spirometric criteria for COPD may have respiratory symptoms and reduced physical activity. They may have other subtle abnormalities of lung function (Elbehairy 2016). Smokers are also at risk of developing lung cancer, and cardiovascular disease such as ischaemic heart disease and peripheral vascular disease. In susceptible smokers cigarette smoking results in a steady decline in lung function, with a decrease in FEV1 of 25–100 mL/year (Fletcher 1977). While smoking cessation may lead to minimal improvements in lung function, more importantly it will slow the rate of decline in lung function and delay the onset of disablement. At all times smoking cessation is important to preserve remaining lung function (Fletcher 1977). Impairment increases as the disease progresses, but may not be recognised because of the slow pace of the disease. The time course of development of COPD and disability and the influence of smoking cessation are illustrated in Figure 2. The annual decline in FEV1 has been measured in 5,041 patients with moderate to very severe COPD followed for 4 years (Tashkin 2013). The decline in post-bronchodilator measurements was greater than pre-bronchodilator, which might represent progression of disease or tachyphylaxis [evidence level III-2]. The figure (adapted from Fletcher C and Peto R. The natural history of chronic airflow obstruction. BMJ 1977;1:1645-1648 and reproduced with permission from the BMJ Publishing Group) shows the rate of loss of forced expiratory flow in one second (FEV1) for a hypothetical, susceptible smoker, and the potential effect of stopping smoking early or late in the course of COPD. 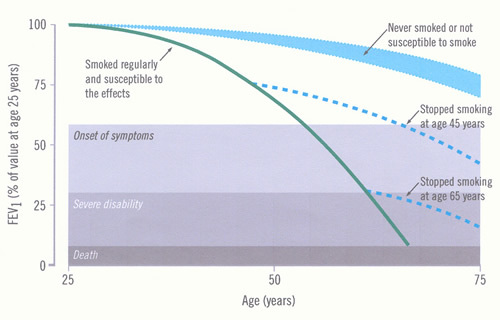 Other susceptible smokers will have different rates of loss, thus reaching “disability” at different ages. The normal FEV1 ranges from below 80% to above 120%, so this will affect the starting point for the individual’s data (not shown). In addition to cigarette smoking, there are a number of other recognised risk factors for COPD (Global Initiative for Chronic Obstructive Lung Disease 2018, Omland 2014) (see Box 2). COPD almost always arises from a gene environment interaction. The best characterised genetic predisposition is alpha1 antitrypsin deficiency, but multiple other genes each make a small contribution and further investigation is required. The risk of COPD is related to the total burden of inhaled particles and oxidative stress in the lung. Occupational dust exposure might be responsible for 20 to 30% of COPD. This is consistent with the findings of a European study (Lytras 2018). This has long been recognised in coal miners (Santo Tomas 2011) but biological dust has also been identified as a risk factor, particularly in women (Matheson 2005). Non-smoking women involved in the spinning, weaving and knitting of cotton or silk have an increased risk of death from COPD. (Cui 2011) Biological dust exposure is also associated with chronic sputum production, dyspnoea and work inactivity in male patients (Rodriguez 2008). Livestock farmers are also at increased risk of developing chronic bronchitis and COPD (Eduard 2009). Dairy farmers have increased wheeze and morning phlegm and increased rate of decline in FEV1 compared to controls. These effects appear to be associated more with exposure to animal feed than handling hay or straw (Thaon 2011). Each year of exposure to diesel exhaust increases the risk of dying from COPD by 2.5% (Hart 2009). 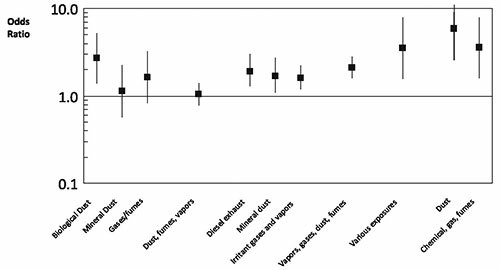 An analysis of a Swiss cohort of 4,267 patients without asthma found that COPD was associated with high occupational exposures to mineral, biological dusts, vapours/fumes, vapours, gases, dust or fumes (VGDF). The findings were clearer in non-smokers and those without chronic bronchitis (Mehta 2012) [evidence level III-2]. A meta-analysis of 6 cross-sectional studies found that occupational exposure to respirable quartz dust was associated with a pooled reduction in FEV1 of -4.62 (95% CI -7.18, -2.06) % predicted (Bruske 2014). A case control study conducted within a large managed care organisation found that self reported exposures to vapours, gas, dust and fumes on the longest held job were responsible for 31% of COPD (Blanc 2009). Joint exposure both to smoking and occupational factors markedly increased the risk of COPD [evidence level III-2]. Evidence of emphysema and gas trapping on CT scans was associated with self-reported occupational exposures to dust and fumes in both men and women who were former or current smokers (Marchetti 2014). A summary of the risks of COPD associated with biological or mineral dusts, gases, fumes / vapours, diesel exhaust, irritant gases / vapours, chemical gas / fumes and various other occupational exposures appears in Figure 3 (reproduced from Diaz-Guzman et al 2012 (Diaz-Guzman 2012) with permission). Fortunately the air quality in most Australian and New Zealand cities is relatively good and cooking with biomass fuels (coal, wood, dung, crop waste etc) is uncommon. However a panel study of 84 moderate to severe COPD patients found that indoor pollutant exposure, including PM2.5 and NO2 (oxides of nitrogen) was associated with increased respiratory symptomsand risk of COPD exacerbation (Hansel 2013) [evidence level III-2]. Failure to achieve maximum lung function increases the risk of COPD in later life. There is some evidence that women might be more susceptible to the effects of tobacco smoke (Aryal 2014) [evidence level III-2]. Beyond the age of 45-50 years, female smokers appear to experience an accelerated decline in FEV1 compared with male smokers (Gan 2006) [evidence level II]. On the other hand, a family based case control study involving high resolution chest CT scans found that men demonstrated more low attenuation areas consistent with emphysema than did women (Camp 2009) [evidence level III-2] Nor is it known whether the increased risk among lower socioeconomic groups is due to greater exposure to pollution, poorer nutrition, more respiratory infection or other factors. Novel risk factors for COPD have been reviewed by an assembly of the American Thoracic Society (Eisner 2010a). Exposure to Secondhand (Environmental) Tobacco Smoke was consistently associated with various definitions of COPD; there was a temporal relationship, dose response gradient and biological plausibility. Meta-analysis of 12 studies found a pooled odds ratio of 1.56 (95%CI 1.40 – 1.74). There was sufficient evidence that exposure to smoke from burning biomass fuels was associated with development of COPD in women. Meta-analysis of 15 studies found a pooled odds ratio of 2.23 (95%CI 1.72 – 2.90), but there was significant heterogeneity between studies. [evidence level III-2]. Whilst the risk of biomass smoke in men has only been assessed in three studies, there also appears to be a similarly increased risk of COPD (OR 4.3, 95%CI 1.85-10) (Hu 2010). Pulmonary tuberculosis can lead to scarring and irreversible loss of lung function, however there is currently insufficient evidence that this is clinically similar to COPD caused by cigarette smoking (Eisner 2010a).